Everybody’s got that dusty old bottle of wine laying around that they’ve been putting off drinking for months now. A recession might be just the time to open it. Buying wine and not drinking it is a crime nearly as severe as buying a Ferrari and not driving it or owning a great record collection and not listening to it. 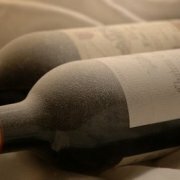 Yet so many wine lovers, even those who don’t consider themselves to be “collectors” can quite easily fall into the trap of finding the acquisition of wine easier to justify than its consumption. Also, as some of you may have been aware, last month marked the tenth annual “Open That Bottle Night,” a nationwide initiative, started by two Wall Street Journal columnists, to drink the wine you’ve been saving for that special occasion. If you missed the date, this is your chance to OTB! We’ll be meeting at Jessica’s place in WestHo. The RSVP system functions like this: if you want in, you click on this link and tell me so (don’t forget your full name, e-mail address, and a cute message conveying to me your intentions). If you’re denied entry due to a meeting exceeding capacity, don’t worry — you’ll be at the top of the list the next week. Once you’ve gotten your confirmation e-mail, dig out that dusty bottle from wherever it’s been sleeping — or find yourself a $10 bill. We’ll see you Winos on Wednesday night.